There is only one water in the Okanagan – snow, rain, lakes, streams, groundwater, water for fish or for drinking, wastewater, stormwater, and irrigation are all connected by the hydrologic cycle and by our shared use. The collaborative Water Management Program was initiated in 2006 to address emerging water issues in the Okanagan. Within the next few decades, water quality and water supply will be impacted by a rapidly growing population and the effects of global climate change. Meeting these challenges requires a regional approach to water planning that bridges the interests of all Okanagan communities. The collaborative Water Management Program connects the dots between the people, the information, the policies and the plans we need to protect water in the Okanagan. 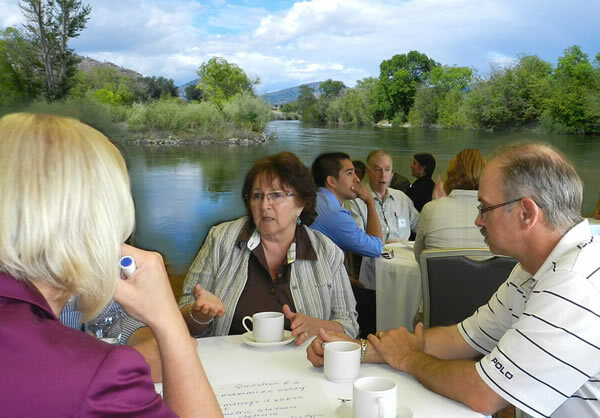 By focusing on valley-wide issues and opportunities, the collaborative Water Management Program complements, rather than duplicates, the work of individual jurisdictions. Find terms of reference for all OBWB programs in the Governance Manual.